Facebook Events Calendar For WordPress will display all events from your Facebook page on calendar. There are 2 layouts for your choice: full and compact. This plugin can be used on 2 ways : Widget or Shortcode. So you can put calendar into sidebar via widget with compact layout, or put into page/post via shortcode with full layout. Why choose Facebook Events Calendar For WordPress ? 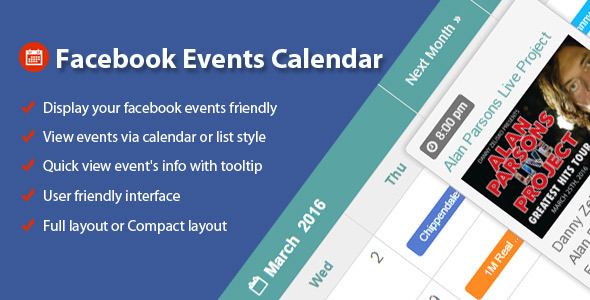 See demo of Facebook Events Calendar For WordPress here! Now let try Facebook Events Calendar For WordPress !